“Ooh mama, can we make Meadow Tea pleeeeease? 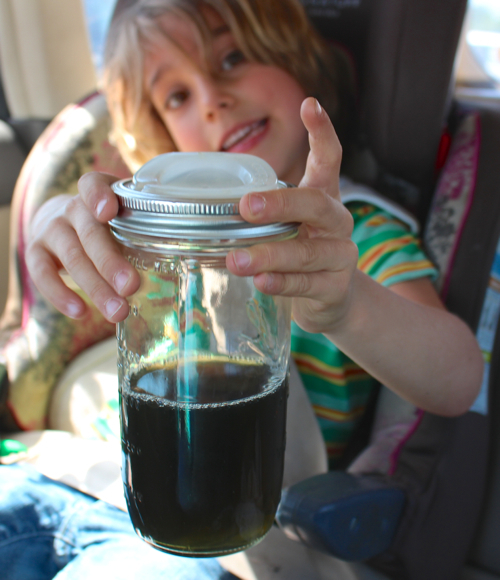 ?” Waits squeals at me as we pass our favorite herb stand at the Saturday Farmer’s Market. It’s spring time in California and the plants are just about bursting from his table. I scan the contents looking for the one key . . . and yes! I spy nettle amidst the messy bundles of nasturtium, oregano, tarragon, and shiso. I spy nettles, and that means it’s Meadow Tea time again. We’ve been making Meadow Tea for 3 seasons now, ever since I found this nettle source here in Santa Barbara. I mean, I fell in love with nettle infusions ages ago back in Portland, but I didn’t start adding the other herbs and aromatics until a few years ago. And now, all spring and summer we get to drink this delicious, icy-cold and oh-so-refreshing, totally nutrient-rich beverage, and we just can’t get enough! It’s easy as pie to make and I’m so excited to finally share the recipe with all of you. 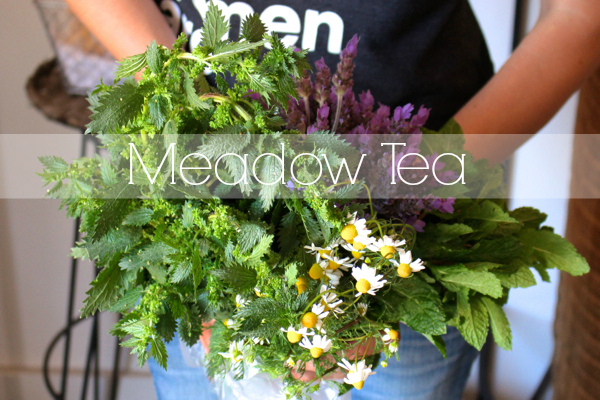 Meadow tea is meant to be a “field blend”, which means you can add any of your favorite aromatic herbs to the mix. I use a variety of plants depending on what’s available, but the one herb I’m always consistent with is my beloved — the powerfully nutritive nettles! Mmmmmm nettles. They’re mineral-rich and medicinal as well, and perfect for children because they’re such a building herb. Bone-building calcium and phosphorous, blood-building iron (one of the very highest plant sources! ), and tissue-building vitamin A and vitamin C. It really is a vegan kid’s powerhouse plant, and I feel awesome knowing that Waits is getting such a superhero infusion every time we make this tea. Nettle grows across most of America, but I know that not everyone has access to this particular plant. If you can’t get your hands on nettle, some wonderful alternatives — which are all impressive nutritives in their own right — are oatstraw, red clover blossoms, and comfrey leaves (leaves only). Any of these will fill the role of nourishing nettles in this recipe. 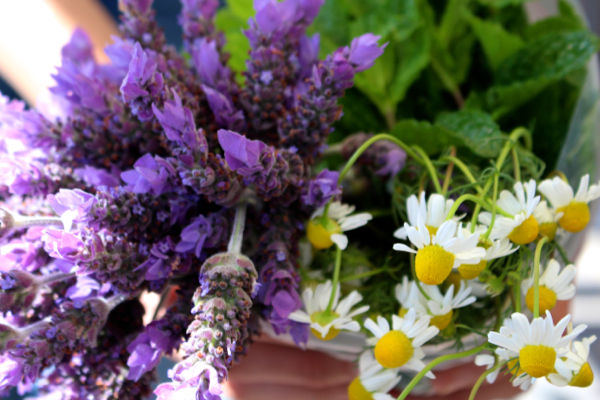 So along with the nettle, I often add mint and chamomile, and fresh lavender when I can get it. Other options include bee balm, lemon balm, chocolate mint, hibiscus, fennel, calendula, elder flowers, and any other herb you enjoy! Each of these plants will impart their own herbal properties — for example chamomile is calming, bee balm is great for digestive issues, and peppermint is stimulating — but more importantly, they taste great too! Play around with combinations to find your own family’s favorite blend of flavors. Making Meadow Tea (a bit of a misnomer — it’s actually an infusion) is super simple. First, get your biggest stock pot and fill it with water. Then, add clean herbs, like lots of them. 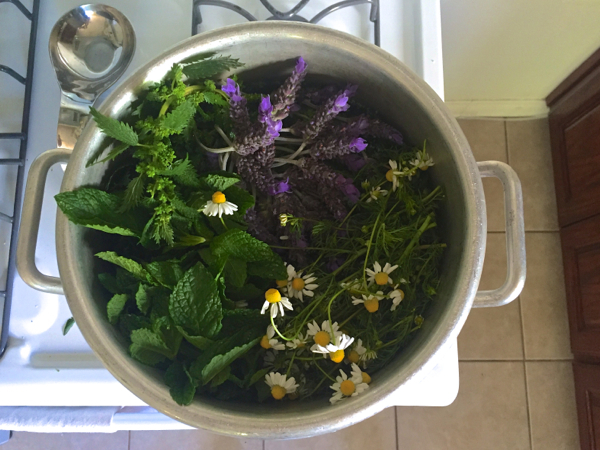 Infusions are meant to be strong, so for example, in the picture above I used a full bundle of nettles, a full bundle of chamomile, a full bundle of mint, and about a half bundle of lavender. Bring everything to a boil, stir the herbs into the boiling water, and then cover with a lid and remove the pot from heat. Now, allow the mixture to steep 4-10 hours (overnight works well, but 4 hours is fine). When you’re done steeping, strain the liquid through a fine mesh sieve or cheesecloth, into a container of your choice. I store my Meadow Tea in a big 1-gallon jar in the fridge, but you can use a few quart canning jars (or whatever you happen to have). Serve cold, with the sweetener of your choice. I like stevia drops (I make my own) or even better, add some fresh stevia leaves to the stock pot when you’re making the infusion! Meadow Tea will keep in the fridge for up to a week. But honestly, it never lasts that long around here. Nice! I’ve always been under the impression that the reason certain herbs are used for nourishing infusions vs others came down to volatile oils. Ie nettles, oatstraw, red clover, and comfrey would all be great left to steep for hours and hours but things like mint, chamomile, and lavender have such high volatile oils that a long steep would be unadvisable, unless it were a cold infusion. One of the perks of studying Herbalism is learning that everyone has a different practice, so I’m happy to see this is a tasty treat for y’all! This sounds and looks divine! Love that Waits is so stoked on it too! Oh yeah, he LOVES this stuff. It’s really great – you have to try it Lysette! It’s true, if you’re using them medicinally it’s best to infuse them in cold water or for shorter lengths of time. Here, I’m using the nettle nutritionally so I’m mostly focused on that, which requires a long strong infusion. The herbs are just for flavoring.